Recently Ady and I were chatting about life here on Rum, on our croft. About readjusting expectations, taking stock of what we have achieved, admitting to the challenges and the things we have not yet managed to make happen. Ady speculated that we have about 80% of everything we ever wanted right here. It prompted me to go and look out the list of hopes and dreams that the four of us made way back when we set off on our WWOOFing adventure nearly five years ago. Around the same time I was talking to a friend here on Rum about what we had come to accept here and what still niggled at me. I mentioned that living in a caravan was never part of my ambitions and plans and she corrected me saying “you don’t live in a caravan. You live on your croft”. In the back of my mind I have been pondering on those thoughts and while we were off last week we all got the opportunity to indulge in the very things which we always list as missing from our lives here. We had unlimited wifi and power, access to tv with multiple channels, a bath, fast food, 24 hour supermarkets. Within reason for a five day period last week we could have everything we wanted, whenever we wanted. To an extent we did. We went to supermarkets, watched TV, had baths, plugged in to the internet, indulged in ready meals and fast food. But very quickly we found it all rather lacking. We turned the TV off, hankered after home cooked food, cut short our supermarket shopping trip and on the last night I didn’t even bother having a bath. It all wore thin very, very quickly. It felt empty, meaningless and without substance. It felt artificial, ill gotten and undeserved somehow. The excess packaging of the fast food and the havoc it played with our unused to such foodstuff digestive systems meant we found it unappealing the next day. The supermarket felt soulless and the reduced to clear items priced at pennies were offensive. We flicked through endless channels on the TV finding nothing worth watching and the internet novelty wore off once we had gone past our usual couple of hours a day timeslot. It began to feel meaningless and disposable. We all felt rather like we were on WALL:E – super evolved humans who no longer need to walk, or eat real food, or do anything at all really, merely sit captive while everything we *need* is delivered to us on a plate. I know we live an extreme version of western world life. Having existed in that world for almost all of my life so far I also know that we feel far more comfortable here doing this than we do back in that life. So back to that bath then. Really? Me, who craves a bath so much that friends here on Rum have offered use of their bath as a birthday gift to me before now? Me who used to bath as a recreational hobby turning down the opportunity to have a bath when one was right there. Glass of wine and bowl of peanuts on the side, hot and filled with scented bubbles, peace and quiet and a book to read, warm fluffy towels waiting for when I get out and then just pjs, a sofa and TV to relax afterwards. Well yes. I spent some time in the bath I did have thinking and pondering on Great Baths I Have Known. I didn’t always love baths you see. My love affair began when Ady and I bought our first house together. I was 20 and worked full time, doing loads of overtime to help pay the mortgage, the bills and contribute to doing up the house. Evenings, weekends and days off were spent stripping wallpaper, sanding floors, sorting out the garage and the garden, painting walls, building a home. It was dusty, dirty and tiring and at the end of a long day at work or at home sinking into a bubble bath was bliss. Then we had children, along came Davies and Scarlett and the bath at the end of each day would punctuate the changeover from Mummy to Nic. I would do bathtime for the children, filled with bath toys, splashing, singing and bubbles, they would head off to bed and then it would be my turn to soak away that side of my life before emerging into grown up world of the evening and dinner with Ady. Somewhere along the way I think the bath stopped being about getting clean, or relaxing in bubbles and became symbolic of the reward at the end of a day. It became ritualistic to the extent that I probably didn’t even need to add water, merely sitting down in a specific spot and changing my clothes would likely have had the same mental effect. Like kicking off your high heels or taking off your bra or letting your hair down from a tight ponytail. A sense of relief and a deep sigh. So here’s the thing. It turns out that in my current life I don’t really need that transition or punctuation mark from one part of the day to the next. Because I don’t actually have parts of my day any more. There is no Monday morning to contrast with Friday night. So while I can certainly still enjoy the indulgence of a hot bubble bath, glass of wine and a good book if there is something better on offer – like a soft bed, or something actually worth watching on TV, or a chat with Ady or the children, or a magnificent view of the Forth Bridge… then actually I would probably rather do that instead. We’ve been off island to Mainlandland. Five nights away from Rum, the croft, our ‘normal’ lives. We left on the Wednesday ferry and took the opportunity to go to Canna for a couple of hours. Canna is one of our neighbouring Small Isles; Rum, Eigg, Muck and Canna. Canna and Rum get paired by Calmac on the ferry timetable as Eigg gets paired with Muck, so on the days when the boat only does half of the islands it will do Rum & Canna or Eigg & Muck. This means that on the summer timetable you can go to Canna on a Wednesday for a couple of hours from Rum, or indeed as we did you can go to Canna and then stay on the boat back to the mainland. We’ve been before a few times, always between Wednesday boats. I think this was our fourth or fifth visit. It happened to be a couple of days after the news story broke about the theft from the Canna shop which had become worldwide news. This meant we shared the boat with tv reporters and papparazzi, some of whom had brought along chocolate to restock the wee shop. We had a quick chat with one or two of the islanders to express support and solidarity, Davies and Scarlett had their picture taken by one of the photographers buying (and paying for using the honesty box!) some chocolate and we also called in to see the newly opened Hebridean Beauty and buy something from there too. We had hired a car for our trip off, after agonising over prices of public transport via car hire & insurance, convenience of a car and lack of need for additional accommodation. 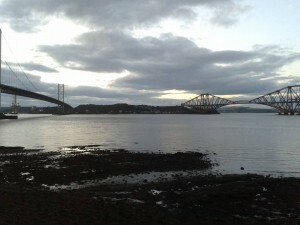 We were staying at a friend’s flat in Queensferry, with spectacular views of the Forth road and Forth rail bridges. We arrived there just before 11pm and fell asleep to the sound of trains going over the bridge. Our reason for being off was to go to all four days of the Royal Highland Show near Edinburgh. We went last year and had a fantastic time and so planned the same trip again for this year. We saw everything the show had to offer – horses in the main arena, a variety of shows in the countryside arena including gun dogs, fox hounds, falconry, sheep dog training and fly fishing demos. Rural crafts including willow, coracle making, skin and fur tanning, wood working. There was chainsaw sculpting, pole climbing, mountain bike tricks. We watched cooking demos, tasted endless food and drink samples, got loads of free giveaways (pen and cloth bag supply for the coming year sorted! ), chatted to people, got great ideas for crafts and things to make and generally had a lovely time. We managed to meet up with two lots of friends on two of the days too so it was sociable aswell. One of the highlights of the trip was someone coming up to us while we were watching one of the shows to say he reads the blog and enjoys hearing about our adventures. He had recognised us from our photos so wanted to come over and say hello. That was so lovely, thank you! I don’t read that many blogs, only really those of people I actually know in real life and want to keep up with so I am always astonished at how many people read this blog and it’s lovely to meet readers. This is the fourth time we have met a reader of the blog in real life and it never stops being really special. While off we took the opportunity to do a bit of shopping – Ikea and supermarkets, to stock up on various mainlandy bits and pieces. We had baths, telly and were able to sleep with the windows open which we never get to do here at home (its always too windy, too midgey or just too cold!). As always though the very best bit of going off is coming home again. Home to Bonnie going mad with delight at the pier when she spotted us getting off the boat. Home to collecting the ducklings and chatting to some daytrippers about them as they stopped to coo over them. Home to walking around the croft checking on all the creatures and crops and marvelling at how much everything and everyone had grown in just five days. Home to our own beds, our own food and our own space. Ady fashioned a door with more leftover wood. It wedges in and has two twirly bits of wood to hook it closed. When (if) summer eventually arrives we will also hang a piece of netting over the door to allow it to be left open in high temperatures but keep pesky chickens out. Ady has cut down all the grass inside and put a row of shelves along one side. We will put paving slabs down the centre to make a walkway and intend transplanting our strawberries into a permanent bed in there once they are over for this year. We will put shelves down the other side and then plant everything else into containers. 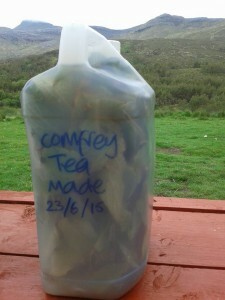 We have a massive collection of recycled containers to plant into – fish boxes scavenged from the beaches here on Rum where they wash up regularly, large tubs which we used to buy crisps in bulk in, vegetable trays which we have collected from the old hostel and shop (the sort mushrooms come in). I have been sowing seeds – ignoring the dates on the seed packets and just going with what I have I have sown wild garlic, beetroot, asparagus, asparagus peas, borage, nasturtiam, tomatoes, chillies, peppers, courgettes. I know it may well be too late in the season but I am hoping with our delayed summer, the polytunnel heat and the long days we may get something happening. I’ll get some herbs sown next time it is midge free enough to get in there again. I made some comfrey tea by adding chopped leaves of comfrey to rainwater in a plastic container. It should take about a month before it is ready and then it will be an excellent feed for the plants diluted with more water. In other news my netting arrived on the boat today so as soon as we can get back outside (midge hell 2015 has landed!) I will be getting the rest of the raised beds licked into shape, weeded, netted and planted up. If necessity is the mother of invention then collecting crap is the father of mad ideas! The loss of the community polytunnel this winter really set us back – we had made full use of that the last two years getting a head start on seedlings using it as a greenhouse, putting in a permanent patch of strawberries which thrive under plastic and growing crops such as tomatoes, chillies and peppers which you can only really grow under glass or plastic in this country and extending the growing season with things like salad and herbs. Not having that space this year, particularly when spring has been such a long time coming was a real blow. 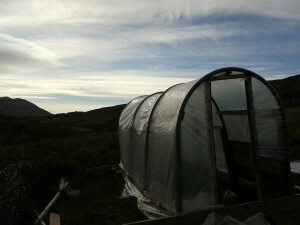 We have been pondering ways to make cold frames, a mini greenhouse or something similar. I had even started drawing up plans for a geodesic dome as we had the scavenged plastic from the ill fated polytunnel, ripped in many places, stretched, damaged and irregular in shape. Then we went to Harris beach for Ady’s birthday and a very long stretch of black plastic pipe that we had been eyeing up for about 2 years but never worked out how to get back to the croft was finally retrieved by Ady’s genius idea to take a saw with us and cut it into sections short enough to put on the car roof. 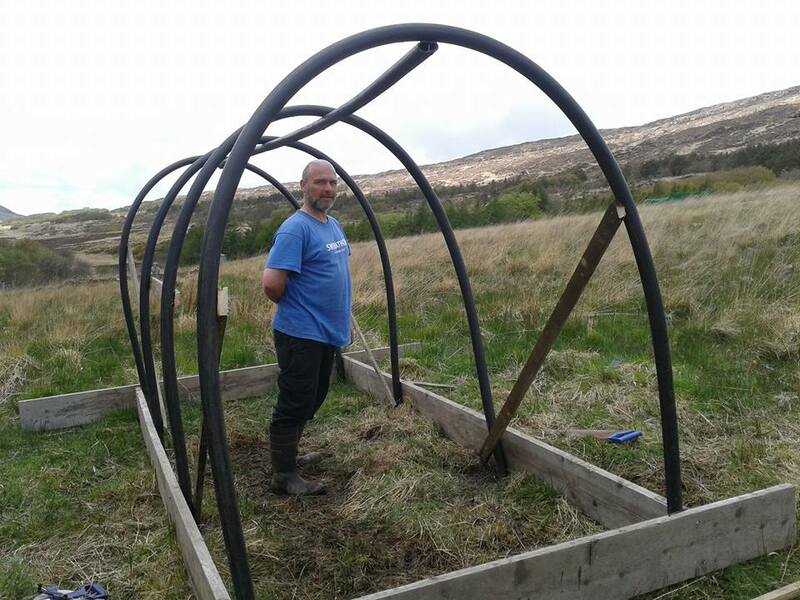 Ady spent ages working out how to construct a polytunnel using the tube as the basis with several failed attempts, lots of swearing and plenty of nails, screws and scrap wood being used but finally he had a frame he was happy with and stood up to the standard Croft 3 test of ‘can I lean really hard on it with all my weight and wobble it without it falling over’ – this tried and tested method has been developed over several years of bitter experience and thinking ‘it’ll be fine’ about things which have proved very much not fine in the high winds we get here. Using it has ensured our pig pen, bird pen and cob pizza oven base have stood the test of time though so it is now our standard requirement for all things remotely permanent or structural. Tomorrow we’ll fill in the gaps – two sections will need plastic covered panels, one area needs more wood and we need to fashion something to cover the doorway. Then we’ll create a U shaped raised bed around the sides with a path down the middle. We’ll plant some permanent crops, like those strawberries transplanted from the community polytunnel once they have finished fruiting and use the rest of the beds for crop rotation. We’ll put in shelving to start off seeds to transplant into the raised beds and herb spiral each year. Hopefully by the end of the month it will all be finished and ready to make the most of this year’s late start to the season. Scavenged waste materials, found and reclaimned resources, repurposed and recycled stuff. All put to good use here on Croft 3. Further photos and updates to follow as progress is made. 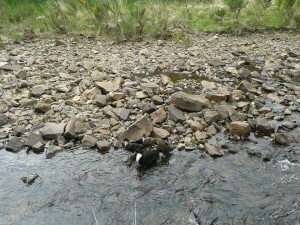 Today we released the mama duck and her three ducklings. She took a while to lead them out and infact she came out a couple of times by herself before finally bringing them out with her. She has been penned for weeks and weeks – the incubation period for duck eggs is 28 days and I think the ducklings are about 6 weeks old now, so penned for about 10 weeks in total. She must have been so happy to get back to that river for a swim. And she took her babies and introduced them to the idea. They took to it like the proverbial ducks to water! 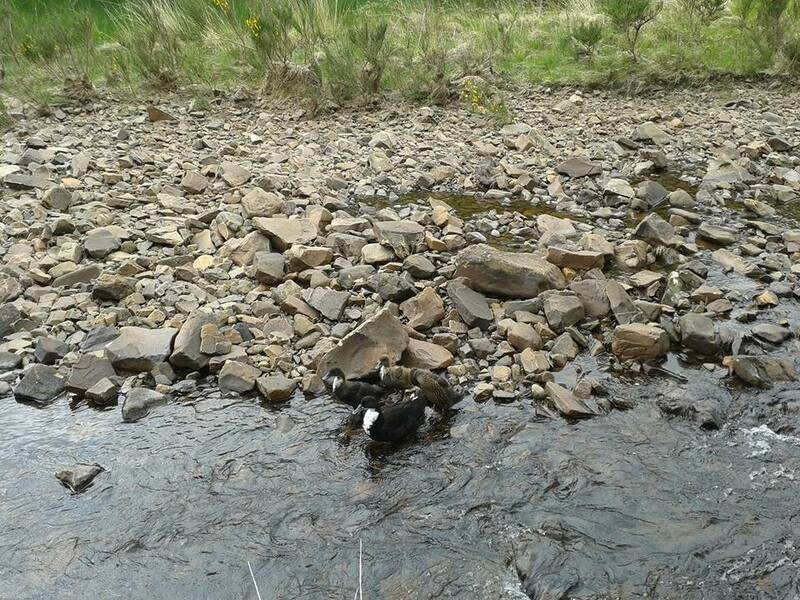 Scarlett was taking her ducklings for a river swim today too. They are definitely smaller than their wilder siblings and with less feathers and more down. We will have to work at toughening them up more. They are outside all day long now in a pen and we will work towards free ranging them gradually. 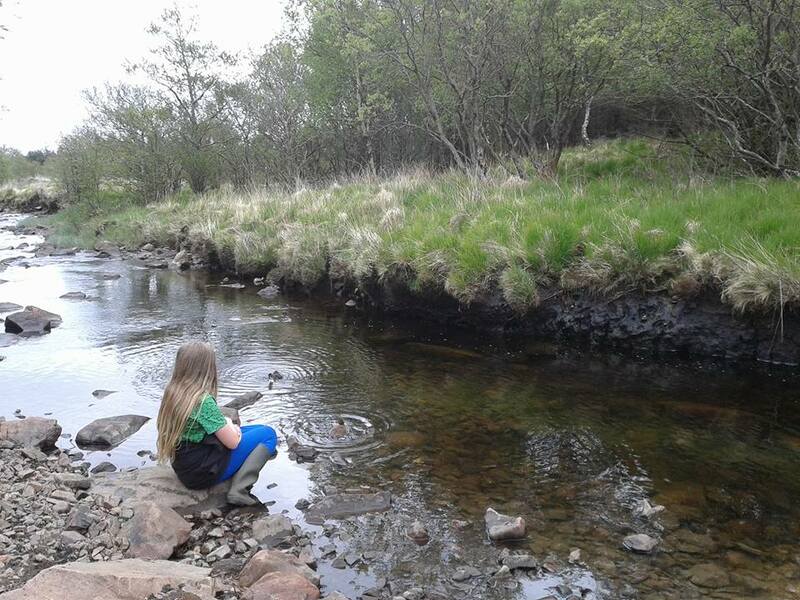 Seeing them all so happy swimming in the river makes me appreciate how lucky we – and they – are to have a river running along the bottom of our croft. The pet ducklings are back inside the caravan for the night while the wilder ones are snuggled up in a heap with their mama, all looking like part of the flock of croft 3 ducks. 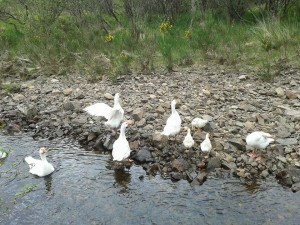 The ailing gosling kept up with the gaggle all day today and also had a river swim. It still lags behind a little but seems to have been more accepted by the gaggle so is also hanging out with the pack tonight outside instead of being penned over night. Meanwhile on the croft we have been weeding, netting and fixing the raised beds in the walled garden. 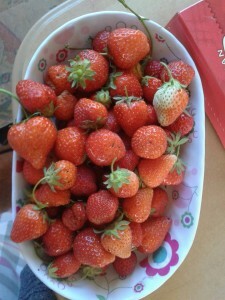 Four of eighteen now netted with hoops and excess netting from the fruit cage roof which I cut off this morning. They are looking good. I have a couple of trays of seedlings to transplant into at least two more beds so more weeding and netting to do. The plan is to use as many beds as possible this season with any unused ones getting a good covering of seaweed and scythed cuttings mulch to inhibit weed growth and add some nutrients to the soil ready for next year. I am hopeful of getting as many as possible planted up though. Finally today we harvested a second crop of strawberries which were delicious for pudding tonight. It’s unheard of apparently, the least midgey year on Rum in living memory. Whilst we’ll happily take that silver lining it does of course mean it is cloudy. And by cloudy I mean bloody freezing! We’re still lighting the fire most days, despite being barely a week away from the longest day. There is daylight aplenty but short sleeves are still but a wistful dream. In other, non weather related news (although were I to read back through blog posts since arriving on Rum I may well realise that there is no such thing as non weather related news here on Rum!) progress is slow but sure. We are expecting our drainage pipe to arrive on the boat sometime this week. Hopefully. The trench is being dug out by our current volunteer ready to start burying the drainage pipe and filling back up to ground level. I have sent out the revised schedule for this year to all the volunteers who are due to arrive with us in July and August and we have been coming up with further plans for the Volunteer Base Camp. We have been keeping on top of the orchard cage which is looking good with all of the most recent planting of fruit trees in blossom. We know it is an investment in the future and hopefully five years from now it will be a productive space rather than something we reap rewards from in the short term but it is heartening to see things doing well and establishing in there. We put wire up today between posts at each end of the rows of fruit bushes to start training the cane fruit and bushes on. 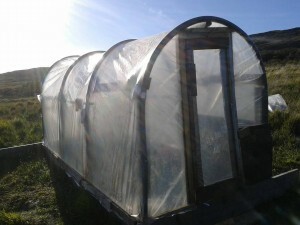 Our next step is to start feeding and mulching in there – we will gather seaweed and start making some comfrey tea from the very happy comfrey in our herb spiral. In the walled garden the seeds we sowed under plastic are doing well and some are ready for thinning. We spent some time in there today discussing the best way of netting the raised beds and have decided to create bespoke lift off net frames for each bed. It will take longer but we have the scrap wood and the netting and it will be a once done worthwhile task. Some of the larger beds will need frames in two or even three parts. We will start on that tomorrow, along with some weeding of the beds and transplanting the hazel and willow saplings which were cuttings I took to make arches for supporting previous netting over the beds which did not work as netting but have thrived as saplings! The various hatchlings continue to mostly do well. 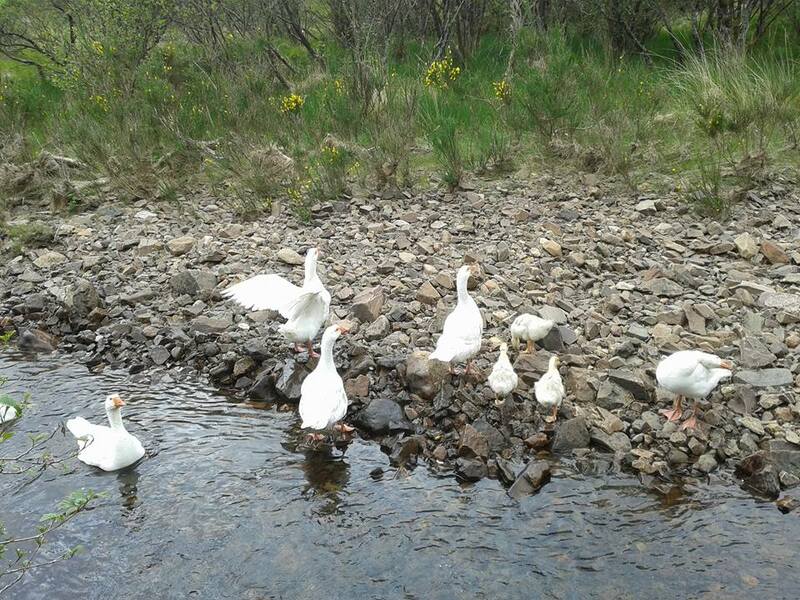 We are at three goslings – two are with the pack of geese and doing well so far, looking sturdy, healthy and being protected by the pack. One was ailing so spent a week or so indoors with us and is now healthy but is being rejected by the pack. We are hoping to integrate it back over time so it spends the days loose but being observed by us as it hangs out close to the gaggle of geese and the night times under a run safe from predators but outside to harden it up. The three ducklings with mother duck are also thriving and will be released from their pen tomorrow. They are feathering up nicely, have grown well and are being very well looked after by her so we are hopeful they will do ok but they need to be out and exploring and taken down to the river by her. We will leave the pen intact so she can retreat there with them if needs be. 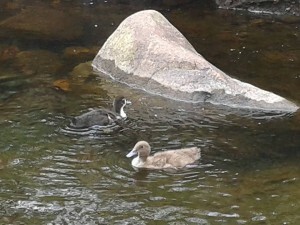 The two pet ducks in the caravan are also doing well, if slower than their siblings (always the way with indoor reared birds) but are outside all day in a pen and Davies and Scarlett take them to the river each day for a swim. They will remain indoors at night until fully feathered and grown and will always be more pets than livestock. The piglets continue to grow and do well. It all feels a bit limbo at the moment, waiting for the summer to arrive whilst knowing that while we’re waiting it is already slipping away.